Summer and watermelon go together like Mac and Cheese. a chilled slice of watermelon hits the spot. 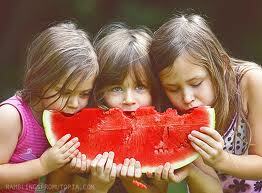 As a kid we would take a half slice of watermelon outside and let the sweet juice run down our chins and arms. Seedless watermelons were unheard of so a little ‘seed spitting’ was in order, too! Mom probably had to hose us down before letting us back in the house. My Mother would always eat watermelon and canteloupe sprinkled with salt. I prefer my watermelon naked but daughter, Sarah, and her friends introduced me to TAJIN fruit with lime seasoning a few years ago. From the moment I tried it, I was hooked and it has become family favorite. The combination of lime, salt and a little kick with the sweet juicy watermelon is delectable. I find TAJIN at Walmart and sometimes at the local grocery store in either the fruit section or ethnic foods section. Give it a try. I think you’ll be hooked too! How many ways are there to use Gooseberries? Not as many as one would think, at least not many that are documented. I’ve never tried a smoothie with gooseberries until I found this recipe. I substituted almond milk for cow’s milk. Very refreshing! A potluck to go to and what to fix? I had beautiful fresh peaches, greens from my garden and avocados. Why not a salad mixing these ingredients topped with nuts? After reviewing several recipes, I combined a few to make this my own and it is now on my favorite summer salads list. Can’t wait for Colorado peach season later this summer! In a blender, combine the vinegar, honey, onions, mustard and garlic. Puree until smooth, 10-15 seconds. Slowley drizzle the olive oil into the blender until the dressing is smooth. Season with salt and pepper to taste. Refrigerate until ready to use (up to a week). In a bowl combine the greens, peaches, and avocado. Drizzle with 1/2 of the dressing. Add more to taste. Toss the salad and serve immediately. Sangria reminds me of summer, tapas, and good times with friends. It’s refreshing, light, fruity and delicious. History states that Sangria was first served at the 1964 World’s Fair in New York. While interesting, I truly expected Sangria to be the drink of Spanish Royalty (or something equally impressive). Nonetheless, it’s delicioso! This time, I made a mock Sangria (without alcohol) as well as the real deal. I enjoyed them both. 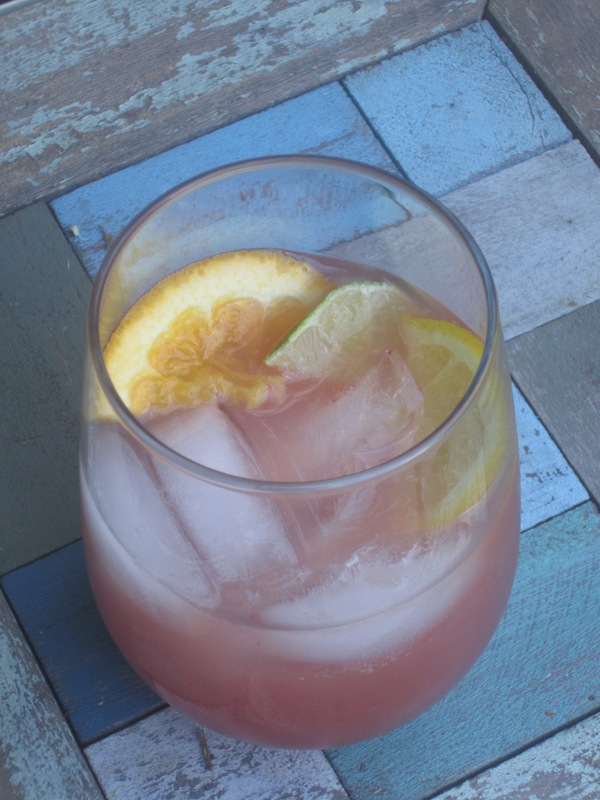 In a large pitcher, combine the wine, brandy, lemonade, and orange juice. Add the fruit slices and refrigerate until chilled. In a large pitcher, stir the juices together. Chill. When ready to serve, add the lemon-lime beverage and stir gently. Fill glasses with ice, then sangria then slices of fruit. Enjoy! Recently I went to the Highland Ranch Town Center Farmer’s Market, http://www.denverfarmersmarket.com/locations.htm, a dangerous place to be when you are hungry. My daughter, Megan, and son-in-law, Christian, and I strolled through the market sampling and buying more than we really needed. However, the wonderful dishes that came from the veggies and fruit were summer delicious! There is nothing in the world like fresh vegetables and fruits. We bought a squash new to us, a round, globe squash. I asked the vendor how she cooks the squash and one of her suggestions was a Vegetable Stir Fry. I also decided to throw in a chopped Japanese Eggplant. I tried, I liked, I shared. Enjoy! Chopped yellow squash, globe squash, zucchini, eggplant (optional), peppers (bell, Anaheim or whatever you like), onion, garlic, fresh sweet corn, fresh tomatoes, herbs of your choice (I used a blend of thyme, oregano, marjoram, rosemary, and basil), salt & pepper. Saute the onions, peppers and garlic in about 1-2 tablespoons of olive oil. When softened, add the chopped squash, eggplant, peppers and seasoning. When the squash is beginning to soften, add cut cooked fresh sweet corn and 1-2 chopped fresh tomatoes. Continue to cook/stir until all vegetables are cooked to your liking. I made a large batch and had leftovers for 2 days. It seemed to get better every day, just like a wonderful batch of soup. Pinterest is a wonderful invention, giving us instant access to so many wonderful ideas. One of those ideas that daughter, Sarah, and I chose for one of the wedding appetizers was cucumber cups. What the heck is a cucumber cup, you say? Read on…. Wash the cucumber. Using a potato peeler, peel stripes around the cucumber. Cut off the round end of the cucumber. Cut the cucumber into 1″ slices. Taking a grapefruit spoon or teaspoon, hollow out about 2/3 of the center of the cucumber. It’s cucumber season so cut some cups for an easy appetizer that will chill you down after a hot day. Quinoa Salad with Strawberries and Chicken…love it! What says summer better than a cool, refreshing salad. I LOVE quinoa and experimenting with different combinations. Today, I decided to combine my affection for chicken salad with fruit and nuts along with the quinoa. Love it! 1 cup quinoa cooked in two cups boiling water for 12 minutes. SUMMER = BBQ and it’s time to get this summer started! Several years ago a co-worker shared this recipe, from Creme de Colorado Cookbook and it has become a summer staple. The chicken is so moist and flavorful. I liked to marinade for 24 hours, but a minimum of 4-5 hours will do. Typically I grill several extra chicken breasts to have the next day(s) in salads. So delicious! Get ready for some yummy chicken for your 4th of July BBQ! Mix all marinade ingredients. Pour into large plastic ziplock bag. Add chicken and assure chicken is coated. Marinate 2-4 hours. Can also freeze in marinade to enjoy later.